Discover paper’s potential as a sculpture medium. Explore various techniques to transform paper into a pliable, workable medium for creating sculptures. Using recyclable paper, tweens will learn to sculpt, carve, shape, and create papier-mâché with this ubiquitous material. 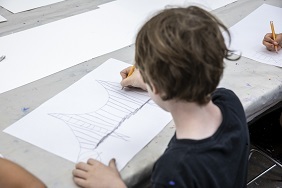 Tweens will start with a concept drawing and work with the instructor to develop their vision! Take your observational drawing skills to the next level! Tweens will draw directly from a life portrait model, focusing on the features of the human face. This camp will explore light and shading, allowing teens to gain a better understanding of the facial structure through demonstration and drawing exercises.